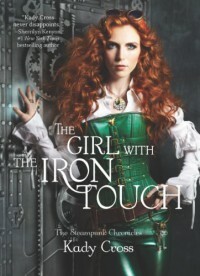 It kind of feels as though this book is the same as The Girl in the Steel Corset. The Machinist comes after someone in the gang, and then the goose chase starts up. Only this time it’s Emily. And another added love interest for the Griffin-Finley-Jack-and now Mila love triangle/square. There was an odd sense of pacing in this book, and the sub-plots and the main plot felt kind of choppy. Emily is in danger? Oh yeah, how about Finley and Griffin make out, and we’ll have Sam and Emily fight off automatons! Mila runs away and finds Jack to tell him that Emily is in danger? Oh wait, how about Mila step inside and have tea with Jack to tell him her story! Like, what are these people doing? Jasper wasn’t even in here for half of the book! Finley is always concerned about Jack living with someone else or doing something with someone else, because even though in clear, concise words it’s stated that she’s “chosen” Griffin, she still wants Jack to want her. This is probably what I don’t like about these books the most: forced and unnecessary love triangles. There’s no legal requirement to put love triangles in books so stop forcing them in! These books could honestly be a lot of fun if there was something beyond The Machinist. Maybe something like a new adventure every book (kind of like The Girl in the Clockwork Collar). Because after a while it starts to feel a tiny bit repetitive. But these books are light and quick to get through, so that’s fun!